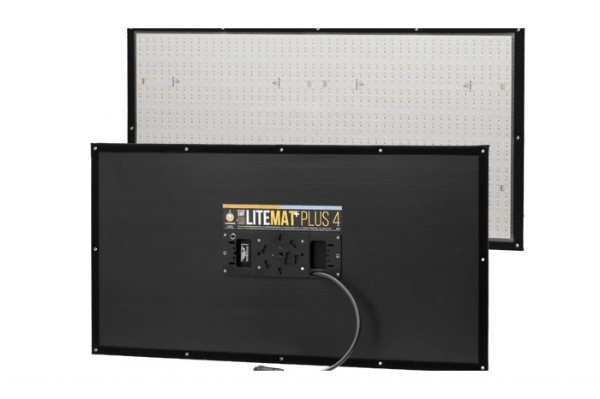 The LiteMat+ Plus 4 is based on three “tiled” light engine measuring 240 mm x 480 mm. The head unit features 2304 new CineMitter LEDs and is covered by a thin, clear polycarbonate layer and bordered entirely with Velcro® “loop” fastener. Mounting is provided with a Kino Flo®-compatible, removable gimbal mount. Bright, bi-color and dimmable. Next generation battery powered LED lamp with 4x the output of the original. Smoother dimming, high colour rendition, with longer throw and intensity. Complete with V-Lock battery adapter. First flexible Bi-Color LED panel for professional use. Small, lightweight and powerful lighting tool for many applications like: portable interview light or to hide in narrow spaces like elevators, cars or even inside objects for product photography. Mains or battery the BI-FLEX1 comes with a dimmer and a mount for 16mm spigot. 1200w fresnel HMI lamp kit with flicker free electronic ballast and 7m header cable. electronic ballast and 7m header cable. Dual lens large Dedo lamp with 400 HMI lamp switchable to 575w HMI. This lamp has the distinction of having an extremely clear beam with no hot spots. This is the classic 4’ 4 bank Kino. Daylight and tungsten options are included along with spare bulbs. The same as the 4’ version but 2’ long for less output or more compact requirements. High output LED lamp that runs from battery or mains. Colour temperature can be varied from tungsten through to daylight with dimming facility. A Kino soft light that is ideal for compact work or overseas. The ballast unit is part of the lamp saving space and is 120-240v compatible. Compact and versatile dual lens lamps. 3 head kits with a central control unit allow creative lighting all from one box. 1.3Kw mains only, smoke machine including a timer and variable output. 200w HMI battery powered lamp with facility of 4 lens set for variable focussing. Kit comes complete with Cine Power batteries for maximum portable use. Dimmable tungsten camera top light with dimmer. LED camera top light that draws little power and has a high output for its size. Ready for any situation, with the R300S SE you can adjust the colour temperature and dim on the fly.